‘Space Tripper’ Review – One Word: Finally! Recently, we mentioned that Space Tripper [$3.99] – the iOS version of Astro Tripper – has finally been released by True Axis the makers of the popular game: Jet Car Stunts [$1.99 / Free]. After being released on various other platforms over the past decade, it’s finally our turn for an iOS port of this top-down arena-based shoot’em-up, which features a main campaign plus score attack and challenge modes to unlock. Although I’m happy to recommend this game now, my initial impressions were less favorable. You see, Space Tripper offers tilt controls as the only option for movement, but strangely, it appears no auto-calibration occurs at the start of the game, so the craft was unresponsive to tilts and left sitting like a lame duck. However, after discovering the tilt calibration and tilt-sensitivity options and testing a few different configurations, the craft became very responsive, ducking and weaving around enemies. The decision to implement only tilt controls will immediately put some players off, but it actually works rather well (after you play with the settings). The developers conducted some trials with touch-based controls early on in their development process, but decided that touch controls obscured the action and weren’t responsive enough. Tilting moves your craft, while tapping the left side of the screen changes weapon and tapping the right side flips the craft around, to face the opposite way. When you flip direction, the craft also slides back a little, which is a subtle movement, but it’s often life-saving when you spin to face an enemy that’s too close. This game requires careful approaches rather than always rushing in, however there’s also time limits for each level, so you need to keep attacking. The weapons shoot left or right, so you need to move alongside an enemy to attack, but there’s no fire button as your selected weapon fires automatically, non-stop. Your ship is equipped with two weapons: red and blue. 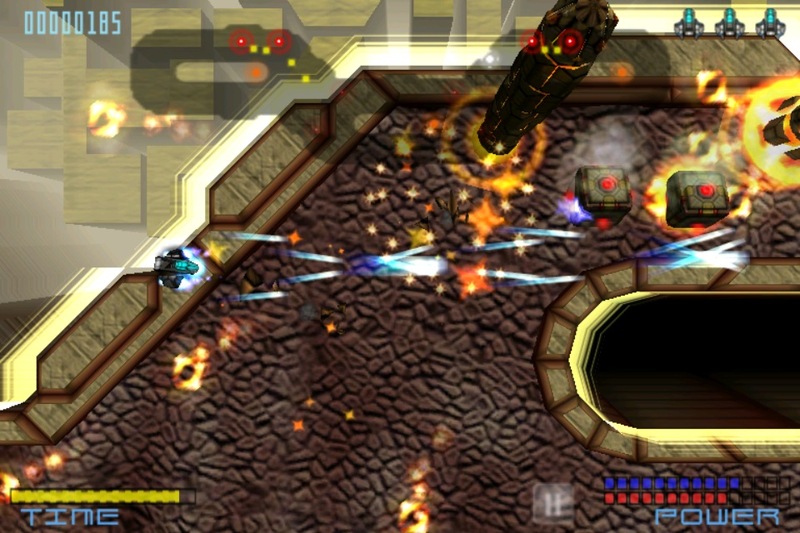 The blue lazer fires a direct forwards-facing beam, while the red weapon fires a three pronged blast, covering a wider range. When you collect a red or blue power-up, the weapon of that color is leveled-up, so you could potentially have a very strong red weapon, but a weak blue one, or vice versa. These level-ups are definitely worth grabbing, as the extra fire-power is helpful for destroying enemies, but importantly, it also looks cool. Whereas many shoot’em-ups are set in a rectangular play-field, Star Tripper uses various different shaped arenas, with 3D features like ramps which you can jump off. You can’t fly beyond the arena, but your enemies can enter from outside, shooting at you even before you can get to them. To keep track of their position, you constantly refer to a handy radar, which shows the position of all enemies on the level. The green enemy blips on the radar turn red when they become aggressive and accelerate towards you, which helps prioritize your targets. 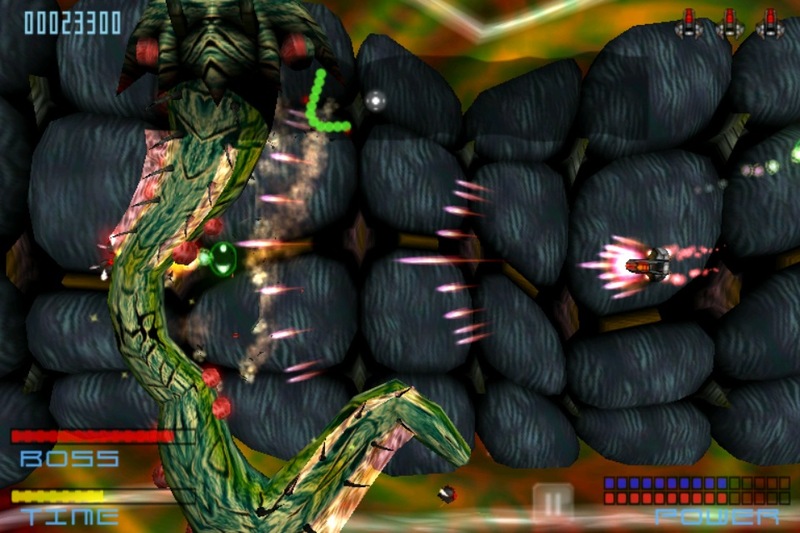 There are four unique worlds, each with their own graphics, enemies and objective. Sometimes it’s all about shooting down enemies, but other times you’re destroying generators or knocking down pillars (while also blasting enemies!). The enemies are nicely varied, including tanks, helicopters, heat-seeking missile turrets and even swarms of insects, fizz wheels and killer-worms. Plus there are big boss fights to reward your efforts. Like a massive yellow spider that crawls and jumps, a big fat tank or a massive one-eyed sea creature. You need to find and exploit each bosses weak-spots to take it out. When your three ships are destroyed, you’re presented with two options – either stop playing and record your score, or continue playing but forfeit your score from the high-score rankings. At first, this seemed like a great feature, as it allows less competent players to continue their game without being forced to restart from the very beginning. However, the continue option only gives one additional life at a time – which is sometimes lost within 30 seconds. This forces you to frequently re-choose continue. It would be better if “continue" granted another set of three lives. There’s three levels of difficulty: Normal, Hard and Hardest. Although one member of our discussion forums joked the levels should be named: “Hard, Yeah right and LOLWUT". Fortunately, there’s some cheats built into the game (as described in the App Store game description). The cheat menu offers unlimited lives and/or invulnerability and the ability to skip levels. The unlimited lives option is great, as it’s still a challenge to complete the levels, but you can keep re-trying and your weapon power-up’s don’t reset when you die. As soon as you enable a cheat, all leaderboards, achievements, game mode unlocking and progress saving are disabled until game over, or you quit. This means legit players can still aim for ranks on the Game Center or OpenFeint leaderboards, without worrying about competing against “cheats". Star Tripper is a fast-paced, nice-looking and challenging game which will appeal to any hard-core shoot-em-up fans, but anyone can progress through the levels to try the boss fights thanks to the “continue" option and cheat modes. It’s taken several years for this game to reach our iOS devices, so perhaps we’ll end up seeing Space Tripper 2, sometime around 2018!